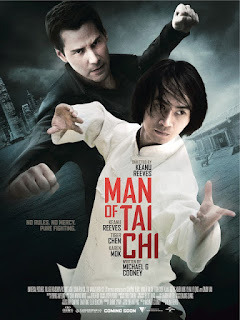 Chrichton's World: Review Kung Fu Hero a.k.a. Kung Fu Man a.k.a. Gongfu xia (2012): Interesting take sadly incredibly poor execution. Review Kung Fu Hero a.k.a. Kung Fu Man a.k.a. Gongfu xia (2012): Interesting take sadly incredibly poor execution. Ping (Tiger Hu Chen) is having one of those days where he rolls from one bad situation to another. And all because of a kid that lands into his care after he discovers him in a box that Ping's boss brought with him to the shop. Naturally something shady is going on and Ping gets chased by the remaining kidnappers. If this sounds like your regular kung fu film then you are right. Although there is one thing that makes it somewhat interesting. The kid called Christopher is obsessed with superheroes. Especially Superman. Who can blame him in a time where we get bombarded with one superhero film after another. Somehow Christopher believes Ping is a superhero. The boy is not entirely delusional since from his perspective it does look like Ping can do extraordinary things. Tiger Hu Chen is helped by some wire works that is a little too obvious and therefore minimizing the magical feel to it. But what really hurts the action is the fact that it is toned down. Probably because this film is meant for kids than adults. I wasn't really impressed with the fights since the choreography was quite sloppy and because of the kid friendly action you never feel there is something at stake. Consequence is that the action never gets truly exciting. And this is a real shame since with some tighter direction and a little more serious action this could have been a real fun movie. Maybe kids will enjoy the clumsy gangsters goofing up and being beaten by Ping over and over again. Among them is a Vin Diesel lookalike who can teach anyone of us a thing or two about never giving up. I'll guess he will do anything for his family (hope you will get the joke). Unfortunately for Tiger Hu Chen this is yet another film where he is not been given the chance to show his skills properly. Although the last twenty minutes do give you a hint what he is really capable off.